This week's show, as I point out almost every week, is a little different. Our guest for next week's full episode is none other than the crimson wonder, the disciple of Bale, the one and only Riser Glen. And when Riser's on...well, let's just say we record things differently. 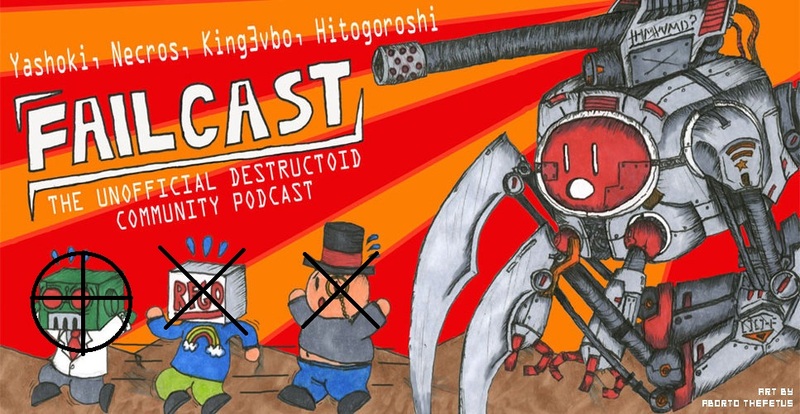 We hope you can forgive us - and by us, I mean an unusually large cast for a preview episode consisting of Yashoki, King3vbo, and Necros - for our deviations. Not to be confused with excusing deviants. Because there is no excuse for shamelessly copying popular art styles poorly and ruining awesome characters. People who use that website: I hate you all personally. Editor's Note: Comments made by Failcast do not necessarily represent Failcast, despite coming straight from its mouth. "Hate" may also mean either "love" or "banana cream pie" in certain third-world countries. Our email address is still [email protected], in case you forgot. Can you afford to not download this as fast as you can?